I really want to say that this book was a cross between a fantasy and a really good bone chilling mystery. So…I think that is what I am going to say. I believe that this author has written other YA books but this is her first venture into YA Fantasy. I also must say that I loved it. This book has that perfect premise…a girl…Avery Hood….raised literally in the woods by her mother and father. Her father is the editor of the newspaper and they live in a very small town. Her parents sort of live “off the grid”. She is home schooled until she is in high school. Her mother sells jams, bakes earthy breads and forages in the forest for mushrooms. Avery never knew how different her family was from others until she began going to school. I love they way she said the first time she knew she was different from her class -mates was when she unwrapped her lunch sandwich and realized her bread did not look like anyone else’s. Garage and yard sales provide them with necessary items. John, the father, is always writing editorials about saving the forests of the town. He hates developers and he is very outspoken. He has enemies within the town. The girl is happy with her life…she is adjusting to school and friends and loves her life with her parents. Her father does not speak to his mother…who also lives in the town…so this causes stress within their family circle so she grows up not really knowing the grandmother who lives close by but whom she never sees. Then one night as Avery and her mother and father are finishing dinner…something happens that changes the course of Avery’s life for all time. The event involves mystery and tragedy and distrust. It involves sadness and loss and it also involves love. Avery is found in the woods covered in blood…she does not remember what has happened to her or her parents. A strange red lock of hair appears in her hair and everyone at school believes she is cursed. A strange new boy begins school and Avery feels connected to him just as he feels connected to Avery. This book involves shapeshifters in the form of werewolves but the actual story is more about the town and what is happening to it than it is about werewolves. The werewolf part of the story is very mysterious and intense and magical. The bond between Ben and Avery is explored in detail and it is very lovely…endearing, even. Ben is her protector…they feel each others emotions and he will devote his life to her. Avery and her grandmother will need Ben…and Ben will be there for them. I loved this book…truly…it was different…unique…sad…and lovely. 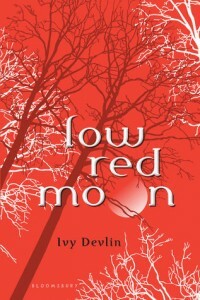 I have attached an awesome link to the trailer that Ivy Devlin posted on her site. I can take paranormal aspects in a story as long as they don't define the story. Thanks for a great review. Hi Emily…I know…I go back and forth too…but I am deep into YA Fantasy this week. Hmm. This story sounds like it has a lot of depth to it. Your review was really good. I haven't heard anything about this book. Thanks for the recommend.